Learn more about ruby-throated and rufous hummingbirds. With bright colors and a pure song, it's a stunning bird to observe. You're likely to hear this tiny woodpecker before you see it. Welcome hummingbirds from Spring to Fall with a hummingbird-friendly space! These flocking finches are fun to watch and easy to attract! Keep your bird feeders clean and safe for backyard birds. When you think about how to get hummingbirds to come visit you, look at your yard and consider what hummingbirds want in a "home". How can you make your yard more hummingbird-friendly? What do hummingbirds like? 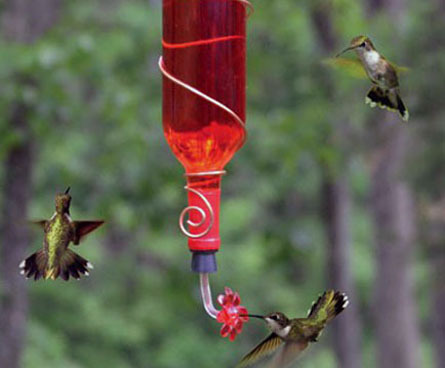 With a hummingbird feeder and some nectar, you are on your way to attracting hummingbirds. You can buy hummingbird food that's pre-made, but how to make hummingbird nectar is actually very simple. The sugar water recipe for hummingbird nectar is easy to make at home. Go ahead and use regular tap water – not bottled water. The impurities in plain tap water are actually better for birds than purified water (and it saves you a little money). Mix 1 part plain white sugar to 4 parts water in a pot on the stovetop. Heat to a boil, stirring frequenty. Once boiling, go ahead and remove the pot from the heat. You don't need to boil the water for very long. Just a minute or two to get rid of chlorine and kill any small amounts of bacteria or mold that might be in the sugar. If you boil the water for too long you risk making the food too sugary. The mixture MUST be cooled before putting it into a hummingbird feeder. Transfer it to another container or cover the pot and let it set in the refrigerator until it's no longer hot. Then you can pour it into your hummingbird feeder or a bottle for storage. If you want to mix up a big batch of homemade hummingbird food all at once, you can store it in the refrigerator for a few days. After that, you'll want to mix up a new batch of hummingbird nectar to keep the visitors to your hummingbird feeder happy and healthy. Hummingbird food must be changed out frequently. 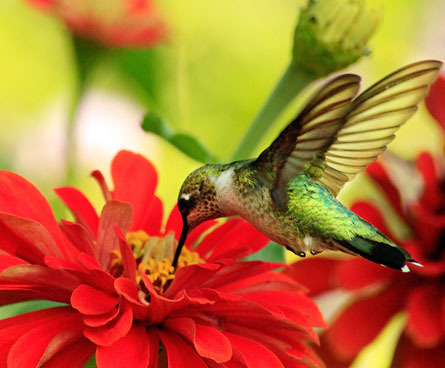 The warmer the climate – the more often you'll want to replace hummingbird nectar so it doesn't go bad. You can tell if your hummingbird food needs to be swapped out by looking at the feeder. If you see anything growing inside it, that's a sign that you need to take your feeder down and clean it out before putting in a new batch of hummingbird food. Another way to tell that you need to change out the food is if it begins to change color or turn into a milk-like color. 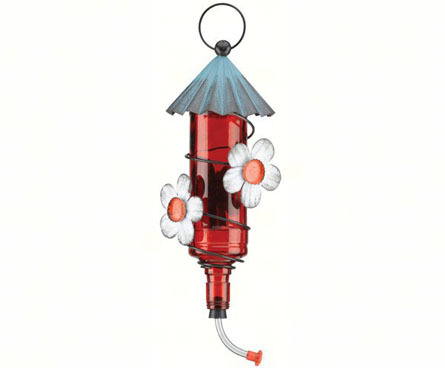 How many hummingbird feeders do you plan to hang in each location? Hummingbirds can be territorial when they are feeding so, if you have several hummingbirds at your feeder, it may be time to add another feeder. If you hang feeders around your yard (and out of sight of one another) you may find you attract and keep more hummingbirds. You don't have to add food coloring to your food (which many people agree can't be healthy for the hummingbirds) or paint your trees red. 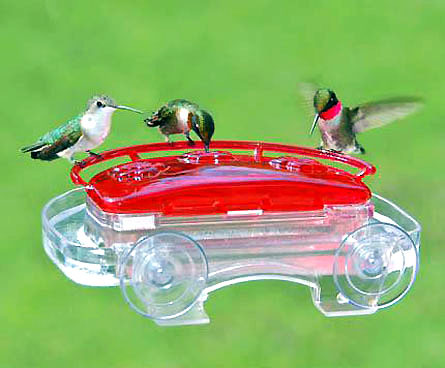 Simply tie a red ribbon on your feeder or use red tape to get the hummingbirds' attention. 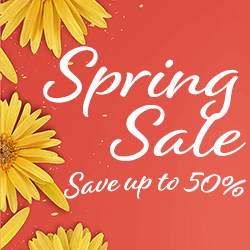 Where are you going to hang a hummingbird feeder? Hummingbirds have great appetites so once they've found your feeders they are likely to keep coming back (as long as your feeders are full). You'll need to clean and refill your feeders a couple of times each week. Make sure to choose a location that is easy for you to get to. Close your blinds or curtains when you leave the house; they break up the glass visually and let hummingbirds know something is there. Use decals or decorative tape to cover the windows. Leave enough glass exposed that you can watch the birds, while helping protect them from the glass. Hang feeders from a tree branch that falls in front of the window. As long as you have a somewhat unobstructed view, you can still see your hummingbirds and they won't run into your window because the branches are there. Move your bird feeders close to the window. That way if hummingbirds do fly towards the window, they are less likely to be injured bumping into a window that is only a foot or two away. Remove houseplants that are near a hummingbird feeder so the hummingbirds don't mistake a houseplant for shelter. Look for a location that is unattractive to predators. Cats love to watch hummingbird feeders and catch hummingbirds as they leave. Some hummingbirds establish what appear to be flight patterns, and a smart cat will easily hide and wait for the hummingbird going to and from a feeder. 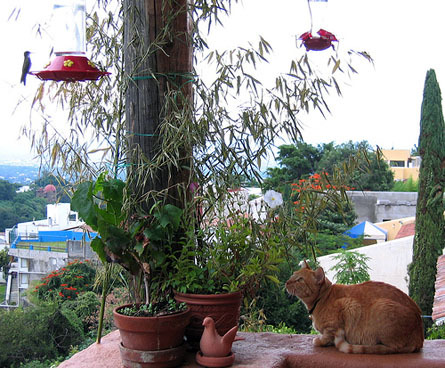 Move planters or other camouflage that can help hide neighborhood cats so the location is safer for your hummingbirds. This picture shows a cat nicely hidden behind a couple of flower pots — the perfect place to attack your precious hummingbirds. 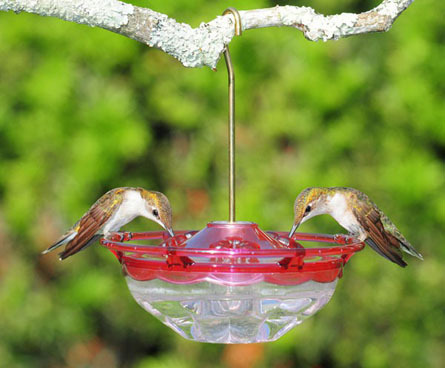 What kind of hummingbird feeder should you buy? There are several common types of hummingbird feeders, and we've found that each one has its pros and cons; however, you may want to try all of them to see what the hummingbirds in your yard like best. Traditional hummingbird feeders are easy to fill. There are a lot of variations that fit almost any preference you have. They can come with and without ant guards to keep ants from getting at the valuable nectar your hummingbirds love. 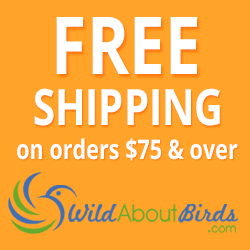 You can also get feeders with or without perches for the birds to sit on. Bowl feeders are the easiest to clean and can come with ant guards. Bowl feeders usually have perches for the birds to sit on, while some can be attached directly to a window with provided suction cups. Once you look at a few feeders, you are sure to find something you think will be a great addition to your yard. Tube feeders, are the simplest feeders, with just a simple end that a hummingbird can feed from. Sometimes wasps can find them attractive too, and can run off your precious hummingbirds so keep an eye on the feeders and wipe them down if the ends get sticky. To keep bees and wasps away from hummingbird feeders, there are a couple of things you can do. Bee guards can keep bees from feeding by blocking their access to the food, but they won't keep bees from scaring off your hummingbirds. If you start seeing a decline in your hummingbird population due to bees, consider giving the bees a place of their own to feed. Remove the hummingbird feeder and place a bowl of sugar water there. When the bees are less active (usually at dusk) you can gradually move the bowl further away from your hummingbird feeder location. Then put your feeder back up and watch your hummingbirds return. Start by emptying your feeder of all hummingbird food. Rinse your feeder out with plain tap water and use a bottle brush to scrub off any visible mold. Mix 1 part liquid chlorine bleach (plain old household bleach is what we use) with 9 parts water to create a simple but effective cleaning solution. Let the hummingbird feeder set in this solution for a few minutes. Make sure it's completely submerged. Then rinse out the feeder with running water. You can let the feeder air dry or fill it up right away with fresh sugar water. You should clean your hummingbird feeder every few days, or when you see a sign that the feeder is not clean (whichever comes first). True hummingbird fans can't stand the idea of their beloved hummingbirds going elsewhere for food while they are cleaning the hummingbird feeders. If you are in that camp, go ahead and buy a couple of extra feeders. That way you can swap out the dirty feeders with clean ones right away, and your little hummingbirds can continue to enjoy the meal. Keeping your hummingbird feeder clean starts with getting the right feeder, and putting it in a location that is convenient for you. If it's hard to get to your feeder, you're less likely to clean it often and keep it refilled. These fast little birds need a lot of energy, so choose a location that makes it easy for you to refill the feeder when it's empty, and clean it out frequently. You can also attract hummingbirds to your yard naturally. You can create a natural humminghird haven in your yard by planting flowers, vines, bushes and trees that flower. There are a wide variety of plants that hummingbirds are naturally attracted to. Whether you want to start small by planting a few flowers, or are about to do more major landscaping and want to add bushes that attract hummingbirds, we've got some green suggestions to help get you started. If you've been taking good care of your hummingbirds and their feeders, they will feed in your yard for generations to come! Ruby-throated hummingbirds, the most common hummingbird in North America, migrate each Winter and often come back to the same area in the Spring. You can leave your hummingbird feeders out as long as you like without fear that your Ruby-throated friends will become dependent on it. When it's time to go, the hummingbirds will fly off as quietly as they came, leaving you with memories (and perhaps a great picture or two) to remember them by until the next season.